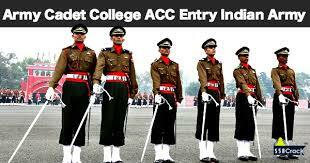 Army Cadet College (ACC) trains soldiers serving in the Army, Navy and Air Force to become officers. It is one of the wings of IMA as is known as SIACHEN BATTALLION. The ACC was shifted from Pune to Dehradun in the year 1977. The training at ACC is a four years programme where in the cadets are also awarded a Graduation Degree from JNU. During first three years of training and the final year training is done at IMA.